Unlike the two previous issues, there is a reference to the latest installment of the Top Ten Poster on this week's cover, teasing readers over the identity of the celebrity voted most popular with readers of the toothy funster's comic. 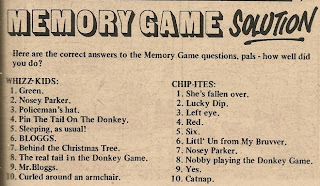 There then follows front-page fun with arthritic athlete Jogging Jeremy, and bactrian banter from Petula. 6 Million Dollar Gran exhibits anger management issues when outraged at the price of chips in her story (again reduced to 2 pages due to pressure on space) this week. 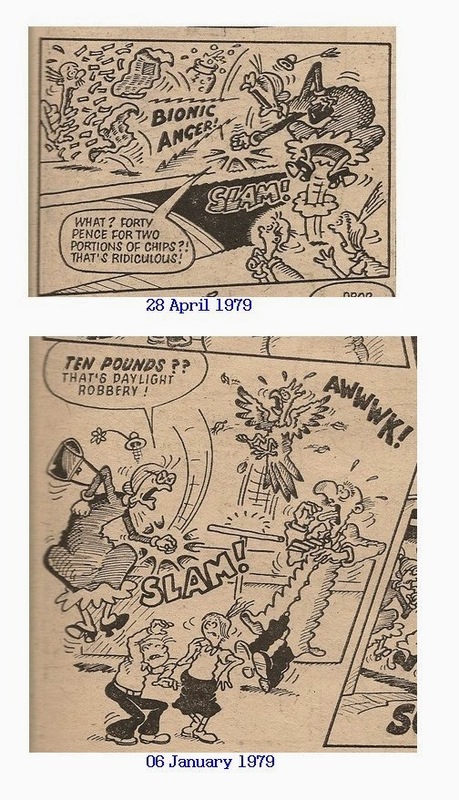 This isn't the first time the aged automaton has caused robotic ructions while shopping – the same counter-thumping behaviour was evident when she attempted to purchase a parrot in the 06 January 1979 issue. Maybe her electronic brain circuits require recalibrating. Nigel Edwards stands in for regular Gran artist Ian Knox for the eighth time, and coincidentally (or possibly not) Nigel also drew Gran's previous explosive outburst. On Monday, in only her second appearance, Hypno-Tessa achieves an astounding feat of mesmerism. This week's tea-based Calculator Kid tale ends on an atypically jarring note as Charlie seems a little unappreciative of his electronic pal's efforts. The scene in the ticket office on Paddywack's page suggests that one of Cheeky's relatives has won the coveted title Miss British Rail. 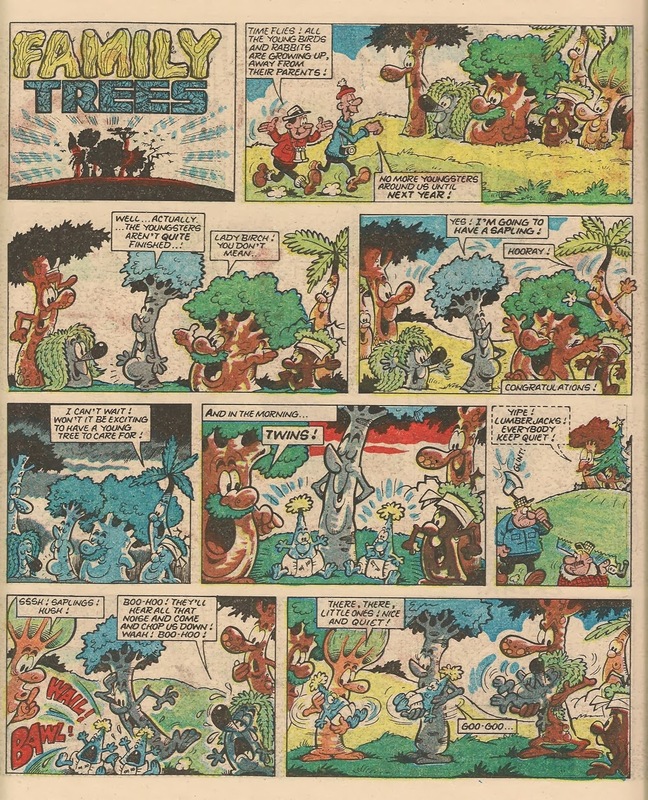 It's been a while since one of Cheeky's pals has made multiple appearances in a single issue - Presto the Magic Rabbit appeared throughout Cheeky's Week in the 21 October 1978 first anniversary comic, but he's not a Cheeky's Week regular. 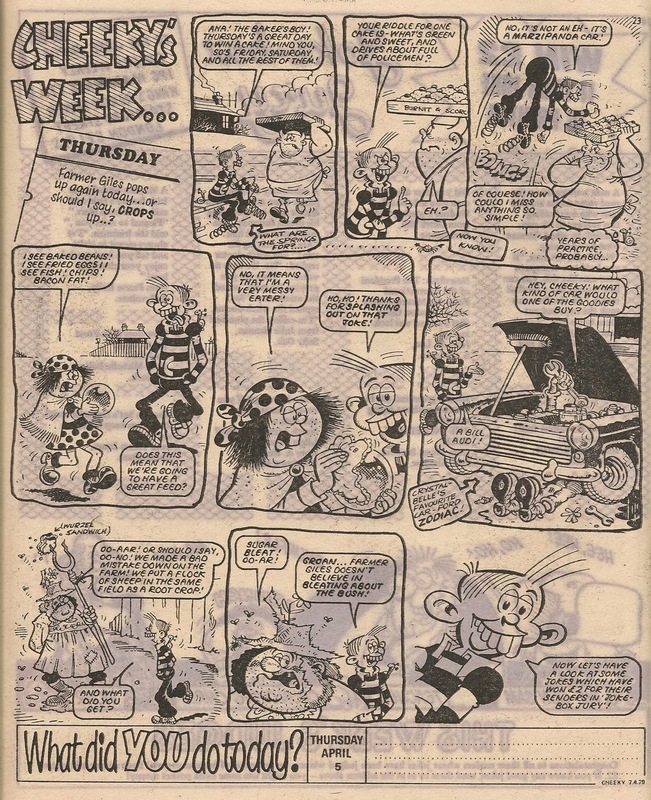 The most recent instance of 'Cheeky's pal throughout the week' was in the 23 September 1978 issue wherein the recurring character was Crystal Belle. In the current issue Hid Kid is 'in evidence' (or at least as in evidence as the extremely bashful character ever is) every day except Friday. On Wednesday he bags first read of the Mystery Comic. A crowd of reward-seeking pursuers mistakes the captain of a ferry for the titular fugitive in Elephant on the Run. 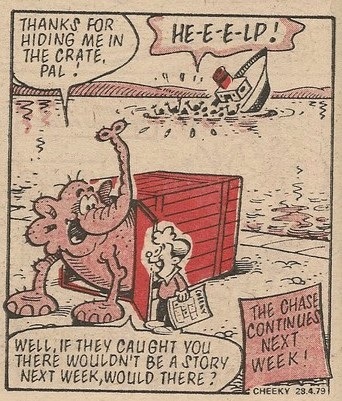 As the ferry sinks under the weight of the mob, we learn that a Cheeky Weekly reader has helped our pachyderm pal evade capture. Star Guest intrudes upon the Mystery Comic pages for the third week running. This time the visitor is Whoopee's Scared-Stiff Sam, whose mum is attempting to engender in her petrified progeny an interest in athletics. Also obtruding on the comic-within-a-comic is (as highlighted on the cover) the final part of the Top Ten Poster. So which celebrity received the most votes in the readers' poll? The winner, teeth gleaming out of the murk of a smudgily-printed black and white photo, is...John Travolta. 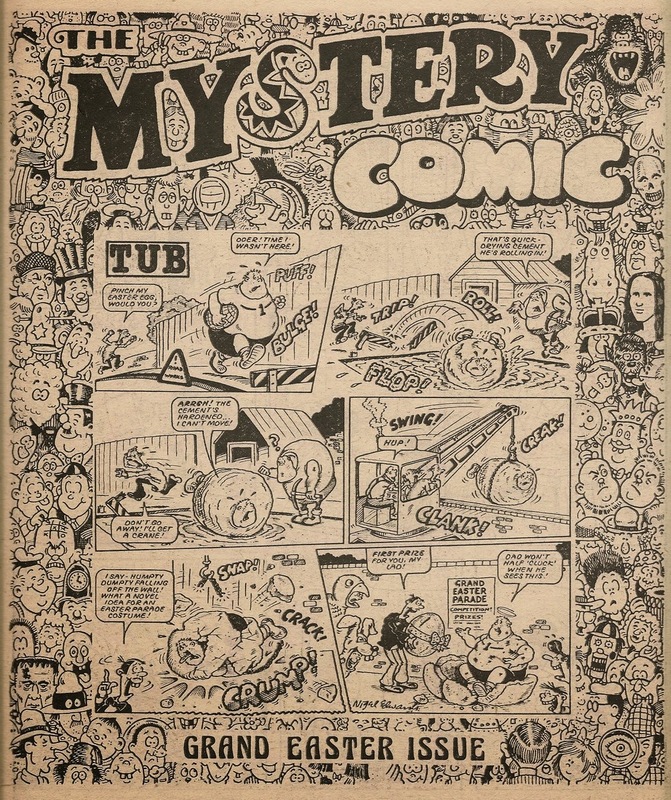 This week brings to an end a run of 4 consecutive 12-page Mystery Comics (the highest page counts to feature in TMC's 37-week run), coinciding with the Top Ten Poster promotion. Despite the extra pages, Mustapha Million has been bumped due to the presence of the concluding 2-page poster segment, Star Guest and 2 pages of IPC adverts (the first consisting of half-page ads, one for new title Jackpot - first issue coming next week - and the other pushing the Buster and Monster Fun Spring Special, plus another page devoted to the Kellogg's Two Shakes promotion starting in Buster this week – as mentioned in last week's Cheeky Weekly). 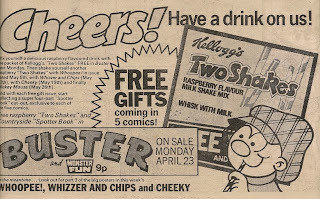 Cheeky's Week resumes with Thursday, whereupon Barrie Appleby takes over artwork duties from Frank McDiarmid for the remainder of the week (apart from a single panel and the Burpo Special). The different style of lettering in Jogging Jeremy's speech balloon in the final panel on that page, together with the appearance of a Frank McDiarmid rendition of the toothy funster, suggests the original closing panel has been changed (making this the fourth consecutive issue to feature such apparent modifications). 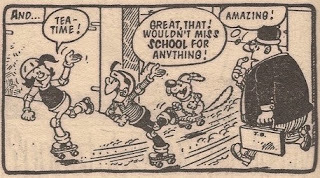 It may be the case that the original final panel contained Cheeky's intro to the Skateboard Squad, who are absent this week perhaps to allow room for the aforementioned Star Guest. On the Chit-Chat page, Cheeky tantalises readers with a cryptic reference to some 'new things' coming soon to Cheeky Weekly. Our grinning pal also makes mention of an upcoming gift, but we first learned about the forthcoming free sachet of milkshake in last week's issue. The Spotter Book he also mentions is presumably yet another in the tedious line of incessant cut-out booklets with which IPC plague their comic purchasers. After a strenuous Saturday spent swapping gags with his pals, a famished Cheeky returns home for his mum's fish and chips. 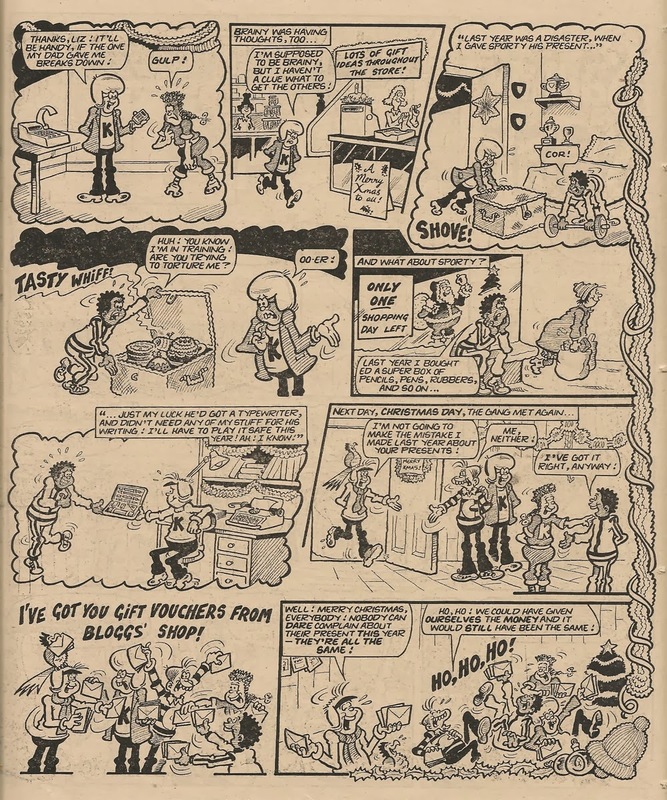 Mike Lacey deputises on the back cover's Burpo Special focusing on Jogging Jeremy, bringing another fun-packed issue to a conclusion. 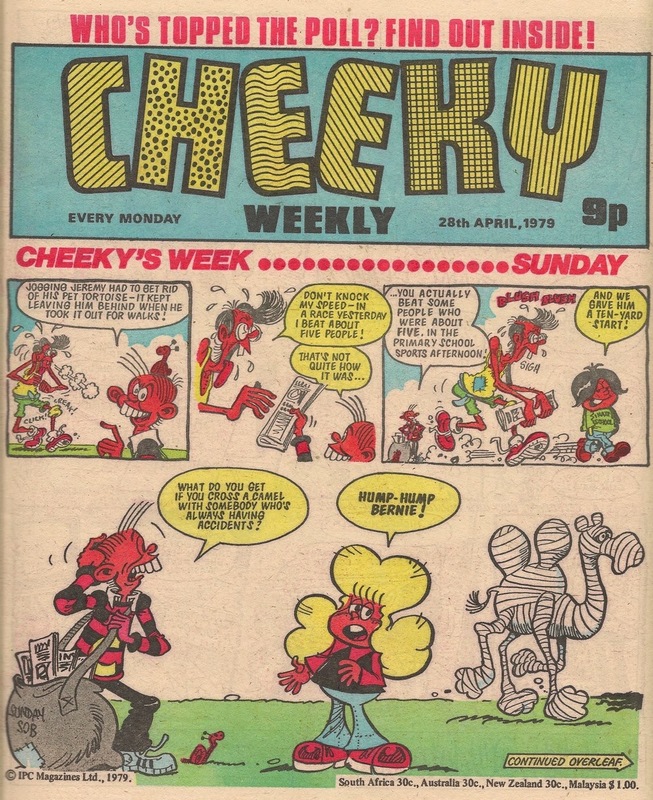 This issue of Cheeky Weekly appeared in the episode of BBC TV's detective drama Shoestring aired on 04 November 1979. 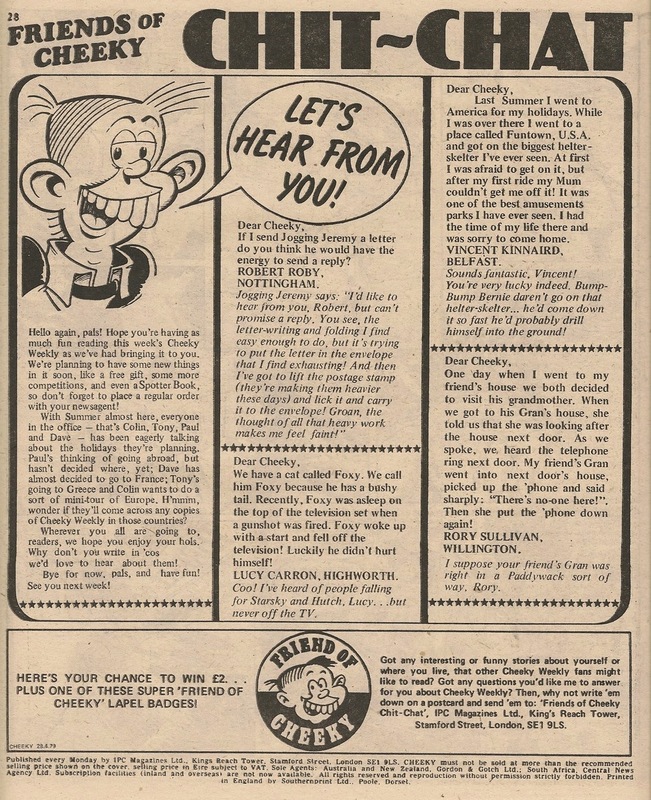 Frank McDiarmid provides 5 Cheeky's Week elements, with Barrie Appleby delivering 4 and Mike Lacey giving us a Burpo Special for the third time. This is the last time Barrie will draw Thursday, Friday and Saturday but he will provide artwork in a further 3 issues. 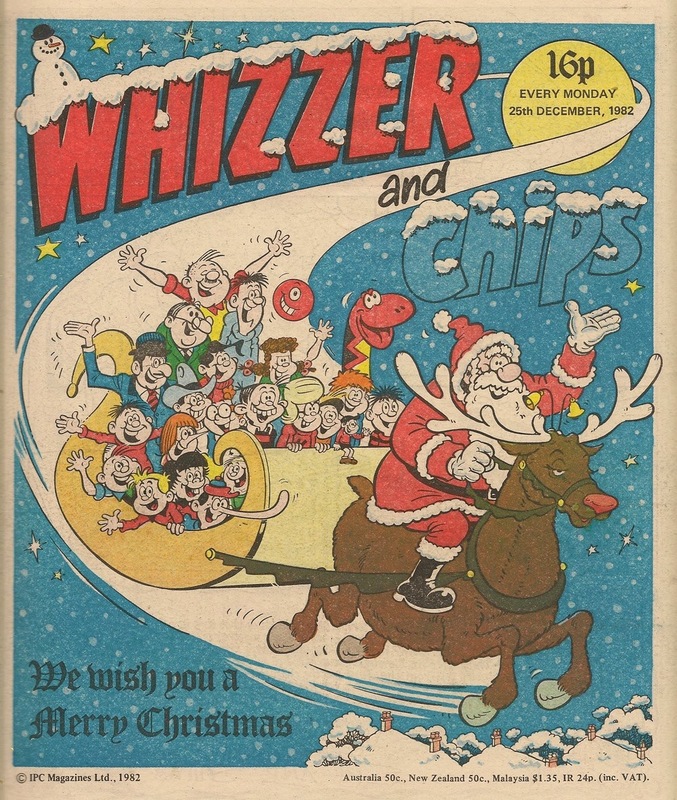 Our toothy pal didn't only feature in an episode of The Krazy Gang in the Christmas 1982 edition of Whizzer and Chips - he was all over this festive issue, as the usual Whizz-Kid and Chip-ite rivalry between Sid and Shiner was forgotten in the spirit of the season. Art: Jim Watson, with cut and paste elements? 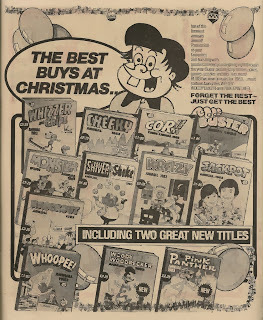 Finally, the Cheeky Annual 1983 is given a plug on page 31. 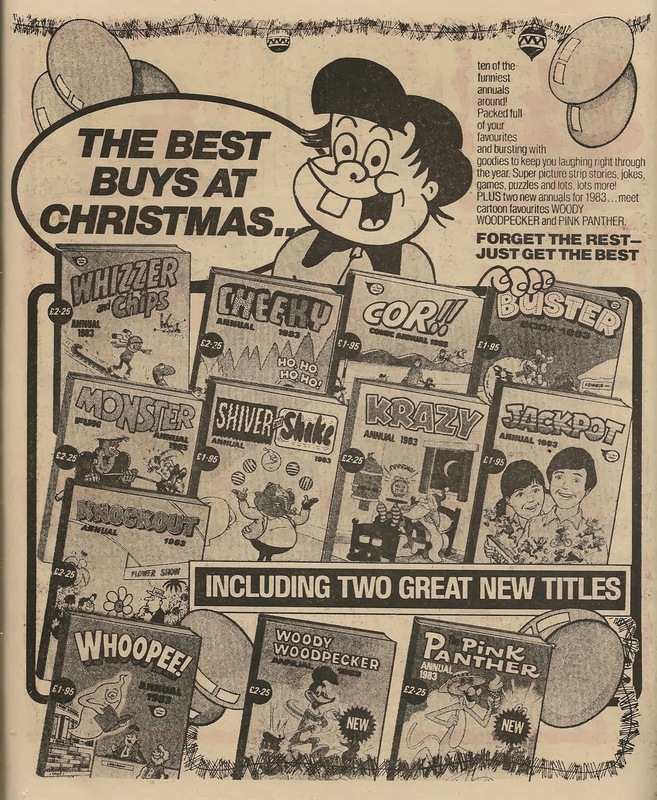 The cover of the toothy funster's end-of-year publication is somewhat obscured on the back row of titles, but that rear rank includes two of IPC's flagship annuals, Whizzer and Chips and Buster, so I don't think Cheeky can complain too much about the placement of his book. 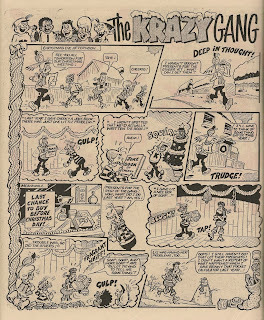 In this blog I have barely mentioned Cheeky's life as a member of The Krazy Gang, who made their debut in the first issue of Krazy just over a year before the toothy funster's own comic was launched. 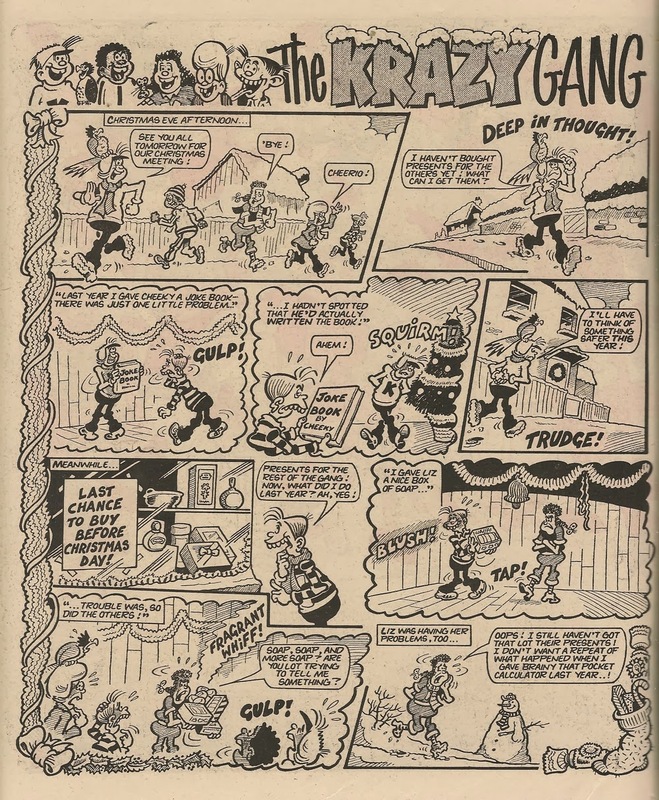 When Krazy came to an end, the Gang's adventures (still including Cheeky) continued in Whizzer and Chips. 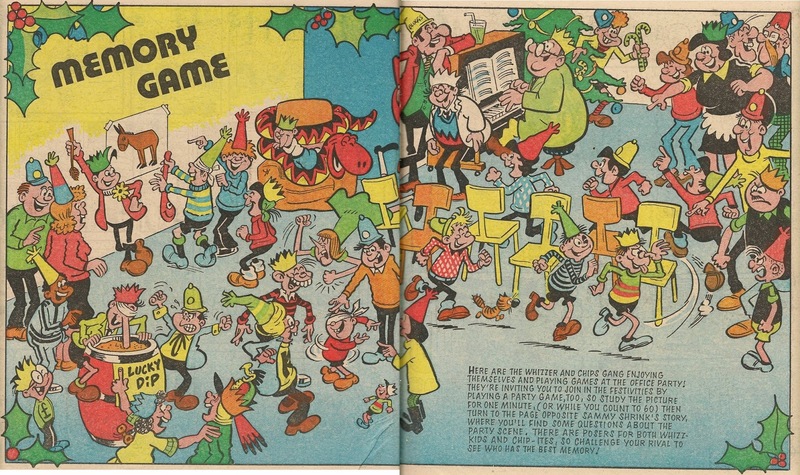 This festive frolic, from the Christmas 1982 issue of Whizzer and Chips (appropriately dated 25 December) and illustrated by Nigel Edwards, suggests that Cheeky was a published author, and that he had romantic feelings towards his fellow gang member, Liz (I hope Louise didn't find out). 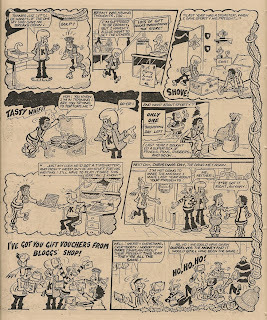 The story makes reference to Bloggs' shop, the main setting of Whizzer and Chips' Open All Hours-inspired strip, Store Wars. 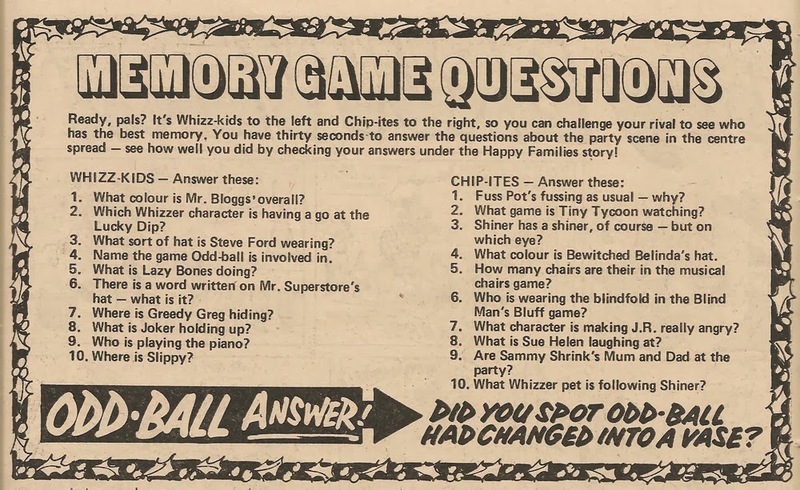 For further appearances of Cheeky in this issue of Whizzer and Chips see here. Cheeky Weekly Star Guests in Whoopee! Week four of IPC's 1979 Star Guest promotion meant it was the turn of Whoopee! to host a visitor from Cheeky Weekly. This time it was The Mystery Comic's doombringer, Disaster Des, who stepped into the role of Cheeky Weekly ambassador. Whoopee! 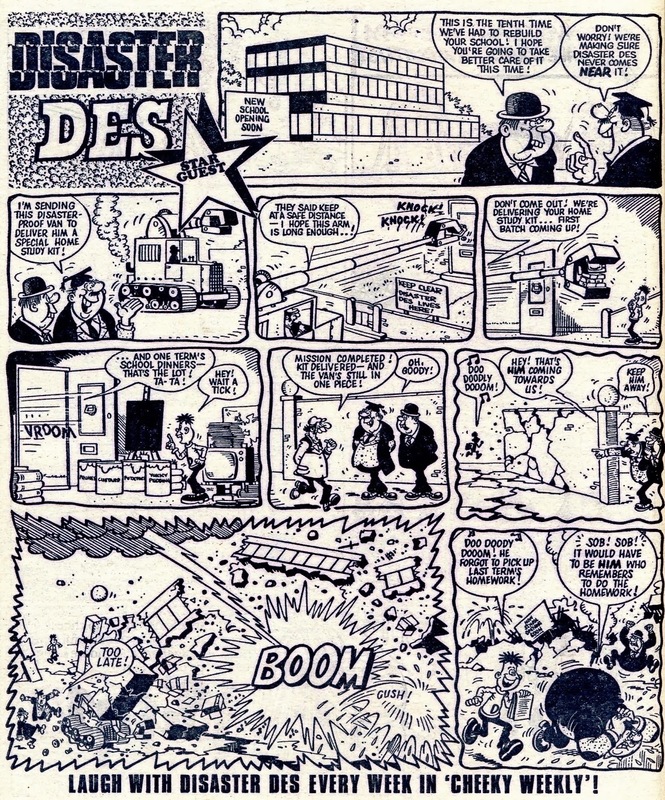 readers unfamiliar with Des' unfortunate influence are brought up to speed by the dialogue in the first panel, and the story's school-flattening climax will surely be widely appreciated by the host comic's readership. I enjoyed seeing Des take delivery of a whole term's school dinners, including a canister of 'yukky pudding'. 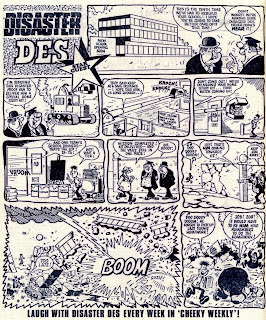 This was a new Des strip, and it never appeared in Cheeky Weekly. 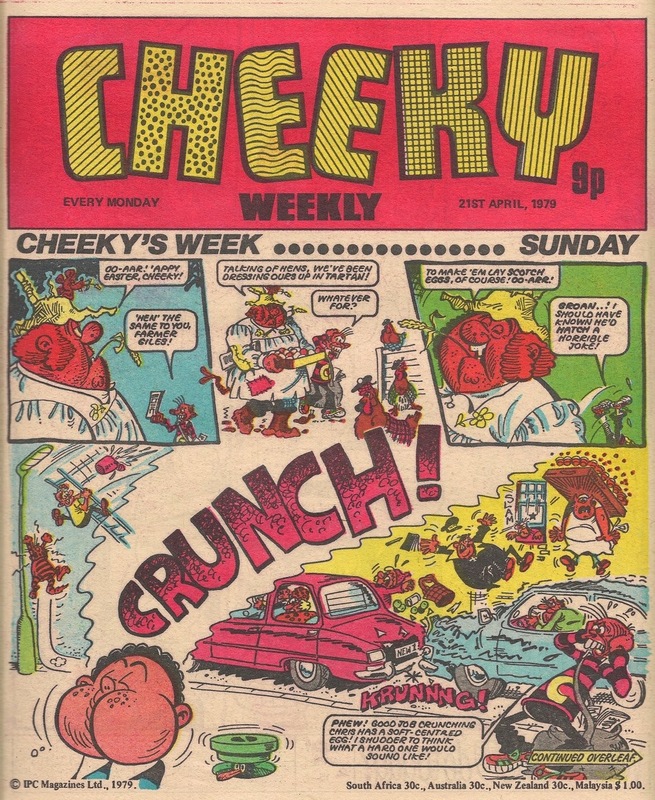 The episode used for this Star Guest appearance could well have been originally scheduled to appear in Cheeky Weekly dated 21 April 1979 (the same cover date as the issue of Whoopee! 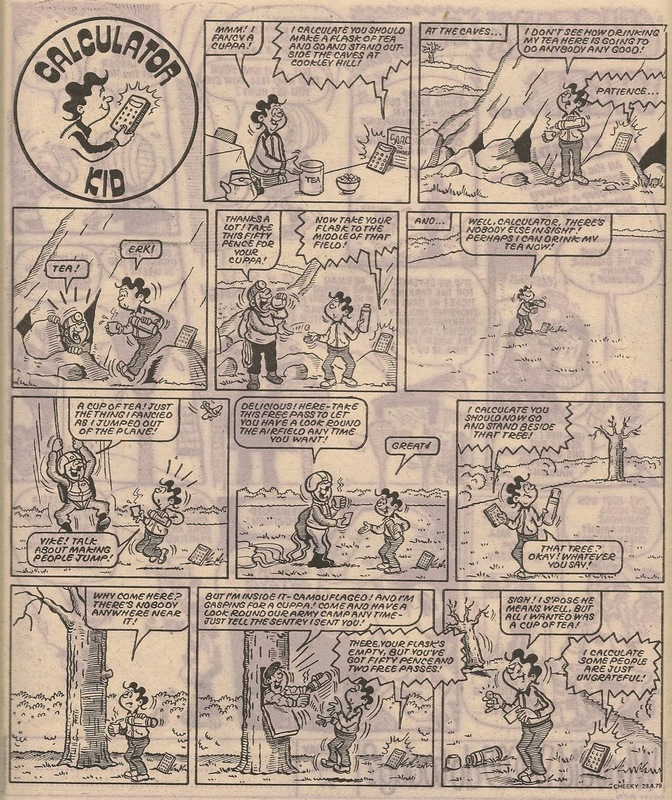 in which it was printed), as Des was absent from the toothy funster's comic that week (which would have been frustrating for any Whoopee! readers tempted into buying the current Cheeky Weekly in the hope of enjoying another Des episode). However, Whoopee! 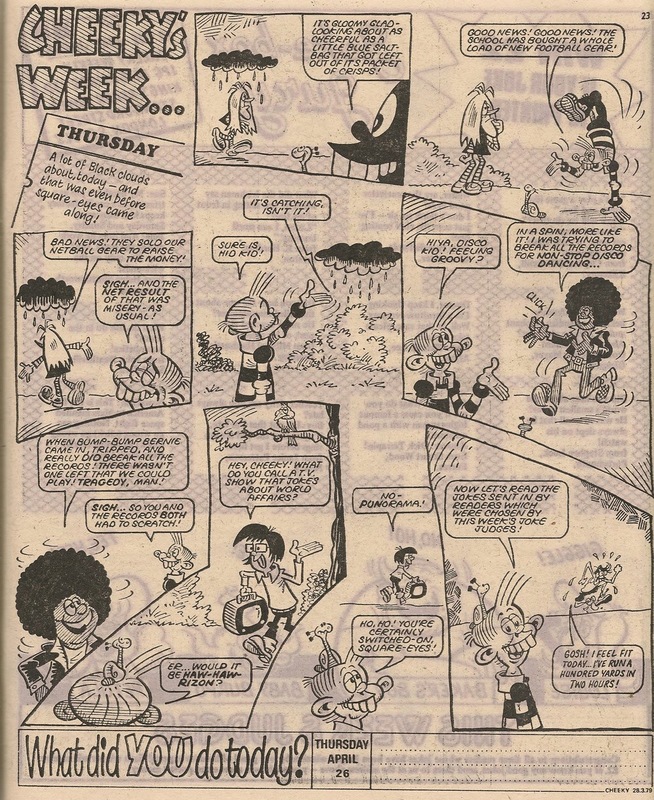 fans placing a regular order for Cheeky Weekly as a result of seeing this strip would have been gratified to find that Des appeared (barring six absences) for the remainder of Cheeky Weekly's run (although ironically Des wasn't among the features that transferred into Whoopee! when the toothy funster's comic foundered). 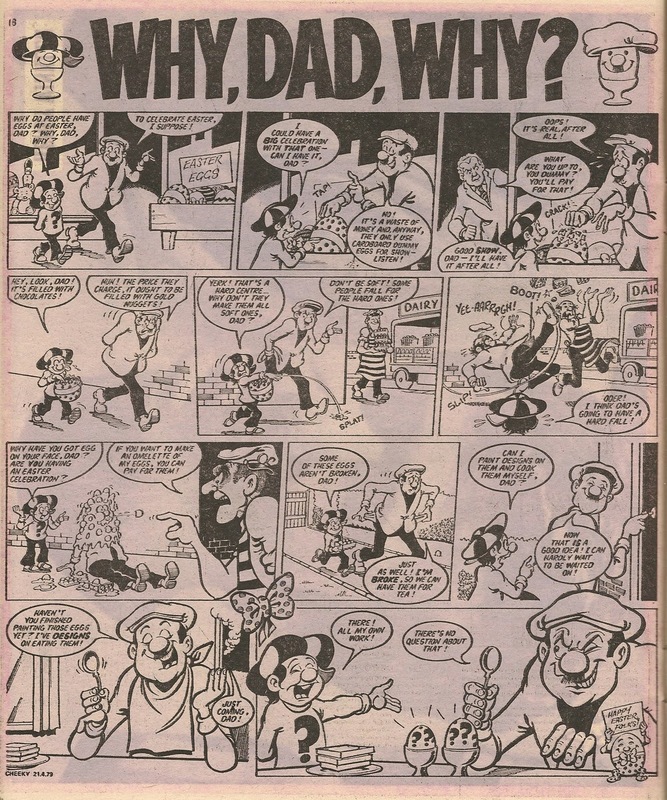 Bruce has posted a Cheeky Movie Masterpiece featuring Constable Chuckle, from an April 1980 issue of Whoopee and Cheeky. We're straight into the comic fun again this week with another cover pleasingly free of promotional fluff, as Cheeky partakes of Easter Sunday badinage with Farmer Giles, then witnesses the fallout from Crunching Chris' cacophonous consumption of seasonal comestibles. An appealingly animated cover from Frank McDiarmid. 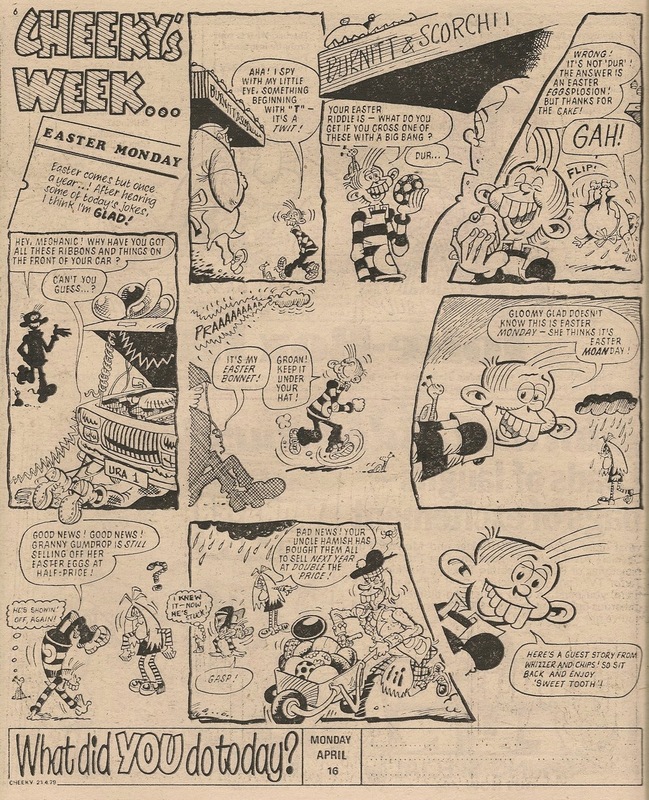 Cheeky cracks more egg jokes as his Sunday escapade continues on to page 2, and the Easter fun extends into 6 Million Dollar Gran's story (reduced to 2 pages this week due to the pressure on space resulting from inclusion of part 3 of the Top Ten poster, adverts and Star Guest). Unlike the cover strip which retains its usual title despite the events depicted thereon transpiring on Easter Sunday (15 April), the Monday page is headed Easter Monday, and of course the toothy funster can't resist more egg-related larks. It appears some alteration to the artwork has been necessary, presumably due to the inclusion of the Star Guest page. 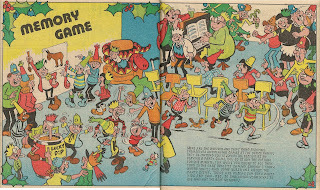 I suspect that the different style of lettering in the page's final panel indicates that an episode of Calculator Kid (who is absent this week) was originally scheduled to follow Easter Monday, but Charlie and Calc were dropped to allow room for a visit by Sweet Tooth from Whizzer and Chips as part of the Star Guest promotion. Thus the original final panel featuring Cheeky's intro to Calculator Kid had to be changed. The drawing of Cheeky used in the final panel was also pasted into the final panel of Thursday in the 07 April 1979 comic. 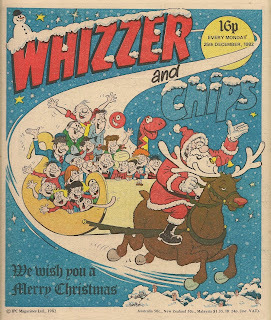 This is the third consecutive issue, each of which included a Star Guest, to feature changes of this kind, suggesting to me that the 1979 Star Guest run encompassing Cheeky Weekly, Whizzer and Chips and Whoopee! may have been a hastily-implemented affair that wouldn't have caused such disruption to the other participating comics, since their features don't include introductions to the following strips and thus could easily drop a regular humour strip at short notice with no need for alteration to the surrounding pages. On Wednesday Granny Gumdrop gives Cheeky a wooden Easter egg, but our toothy pal is delighted to discover that the Grand Easter Issue of the Mystery Comic is concealed inside. 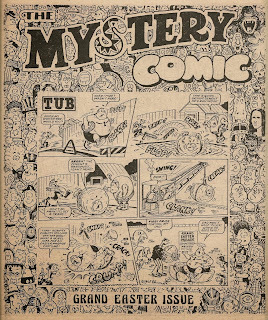 The comic-within-a-comic kicks off with an Easter egg based Tub episode. Elephant On The Run has a typically frantic escapade while at the Easter Fair, and there's seasonal fun in the Why, Dad, Why? strip (featuring an appropriate rendition of the protagonists in the title banner), which for once ends on a relatively amicable note. There's no Easter content in the Mustapha Million story (other than a caption in the final panel wishing readers a happy Easter). 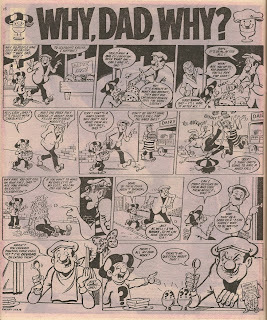 An ad for WH Smith brings this week's Mystery Comic to a conclusion. Disaster Des is missing this time (explaining why his Easter story appeared in last week's issue), because 3 Mystery Comic pages have been devoted to adverts, and a further 2 are host to the the third installment of the Top Ten poster (this week featuring black and white mugshots of Henry 'The Fonz' Winkler at number 3 and Olivia Newton-John at number 2). So much for my confident assertion in the previous issue summary that printing Easter stories in this week's Mystery Comic “would render [them] rather late for Easter celebrations”! Back within the pages of Cheeky Weekly, the Skateboard Squad are enjoying their Easter holidays, but finding the play street packed with kids, decide to use the empty school playground for their recreational activity of choice. The ever-helpful trio then have fun employing their 'boarding skills to assist the school cleaner. It's not only the intrepid Squad members who are going to school despite it being the holidays – on Friday the toothy funster visits his educational establishment in order to sneak a read of the latest Alpha Man episode in Teacher's copy of Teachers Weekly. On the Chit-Chat page there's disappointment for reader Suzanne Platt, who will be leaving Letchworth, bound for a new life in the USA. Our grinning pal has to break the bad news that Cheeky Weekly is not available across the pond, but helpfully suggests that she might be able to persuade a friend to send her a copy each week. Below that letter, Lynette Kannemeyer tells of an encounter on the celebrity-packed streets of Chiswick. 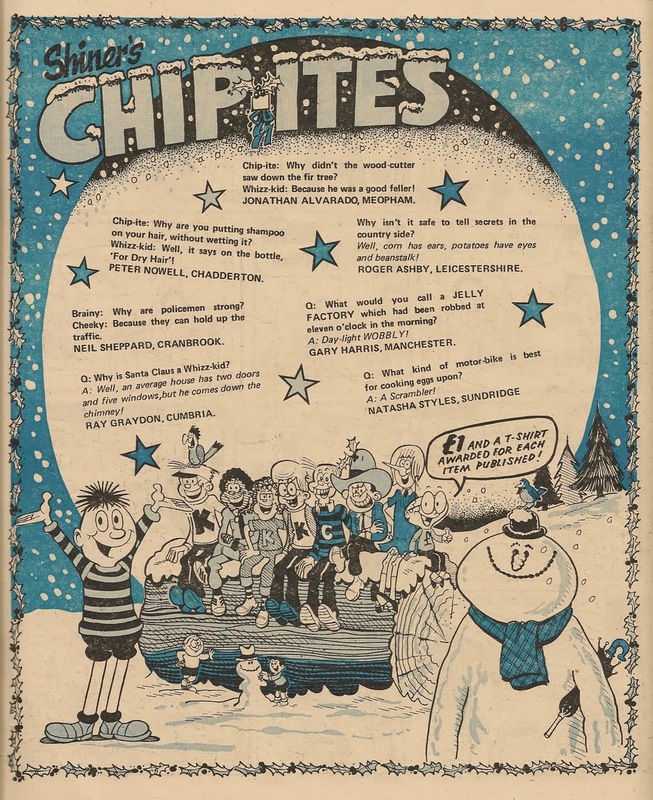 A thirst-inducing half-page ad on page 29 announces that a free sachet of Kellogg's milkshake mix will be affixed to the cover of a rotating selection of IPC's humour titles over the next 5 weeks. 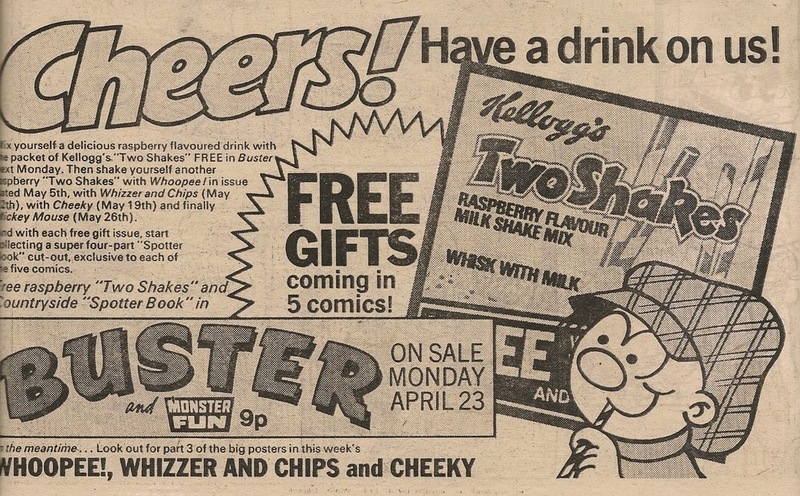 Cheeky Weekly readers will have to wait until the issue dated 19 May to get their hands on the raspberry-flavoured powder, although IPC are no doubt hoping their ploy of staggering the freebies will tempt kids into buying comics other than their regular title in order to enjoy an early milkshake or two. In what is intended to be a mutually beneficial promotion, Kelloggs hope to establish Two Shakes habits that will swell their coffers across the summer months. Knock-on sales, as households around the country find themselves unaccountably short of milk as a result of the consumption of free drink mix, could boost the British dairy industry as well. After Cheeky spends Saturday in the garden, with the inevitable crop of herbaceous humour, the comic rounds off with the now-traditional back page feature, the Burpo Special. This time the subject of Burpo's interrogation is Ursula. There's a recurring, curiously-posed Cheeky/Snail image in this week's issue; on Easter Monday, again on Thursday and once more on Saturday. Frank must have liked drawing it. This week sees a welcome all-pure-Frank McDiarmid-Cheeky's-Week, the first since 24 March 1979. Frank delivers 10 fun-filled elements (including the Burpo Special). 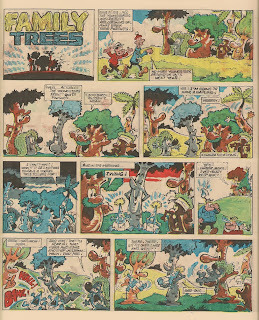 As well as that, there's a nice spread of Easter stories among the non-Cheeky strips. 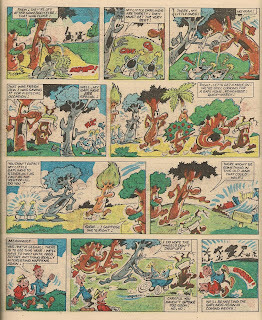 Forgive me for going a tad off-topic here, but reading through Whoopee and Wow! dated 24 November 1984 I was surprised by this episode of Family Trees. The somewhat disturbing story of a pregnant birch tree being delivered of offspring overnight would surely confuse any young readers who were at that point being taught about plant reproduction. 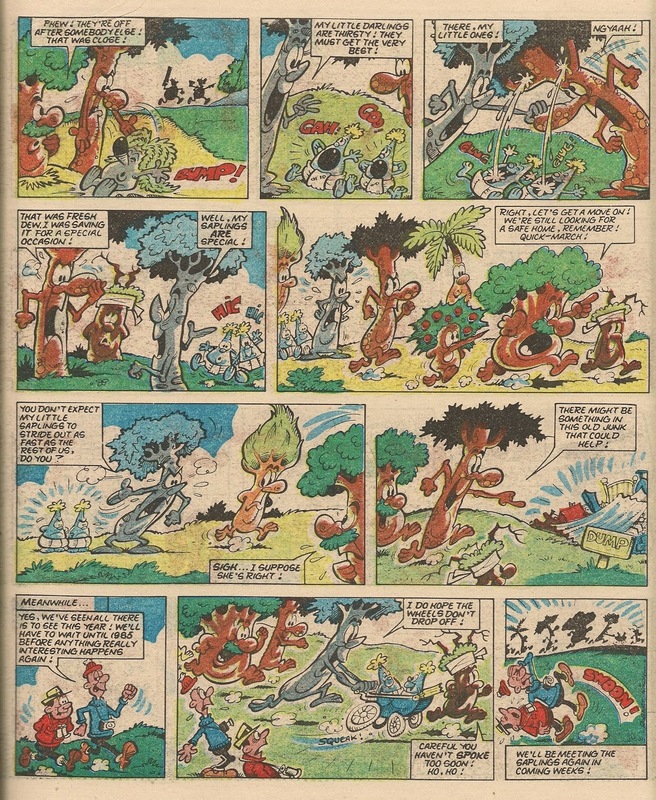 Little did we know prior to this strip that arboreal ardour was rife among the protagonists. Since none of the male cast had the decency to admit responsibility, the identity of the lustful leaf-bearer who fathered the new arrivals remains open to speculation. Palitoy's multi-jointed marvel Action Man first appeared in UK toy shops in 1966, the year in which my age advanced into double figures. I remember seeing tantalising ads for GI Joe (the original US version of the same toy) in American comics some time before AM became available over here. Thus I had been fantasising about staging my own miniature military manoeuvres for several months by the time Action Man's arrival on these shores was announced during an ad break on teatime TV. Much parent-pestering ensued until I secured my very own small-scale scar-faced soldier. The Action Man figures came in soldier, sailor and airman varieties but although the toy's name was changed for UK release, the basic uniforms supplied with the models had a distinctly US appearance. However, a large range of additional costumes and equipment was available in order to expand the fighting figure's area of operations from snowy mountains to outer space. I remember sending my AM on several reconnaissance missions to the depths of the bath after having provided him with appropriate clothing in the form of the scuba outfit. The snug-fitting rubbery costume was very hard to get on and off the figure, and on one occasion while removing his scuba trousers, I was horrified to find that the bottom half of AM's leg had remained within the garment, having parted company with the rest of his body. Fortunately this life-changing injury was short-lived as it was possible to restore his lower limb by means of a plastic connector protruding from the exposed knee joint (not the only way in which AM's anatomy diverged from that of a real-life, healthy male specimen). As if the possibilities for new adventures offered by the additional gear on sale wasn't incentive enough, each pack of accessories came with stars which could be cut out and stuck on a card. A card filled with 21 stars entitled the owner to claim a free Action Man, who arrived completely naked except for a pair of boots. I did manage to get a second Action Man in this way, and it was of course identical in every way to the first (even down to the scarred cheek) except that the new arrival's plastic hair was blonde in contrast to the original's brown pvc locks. 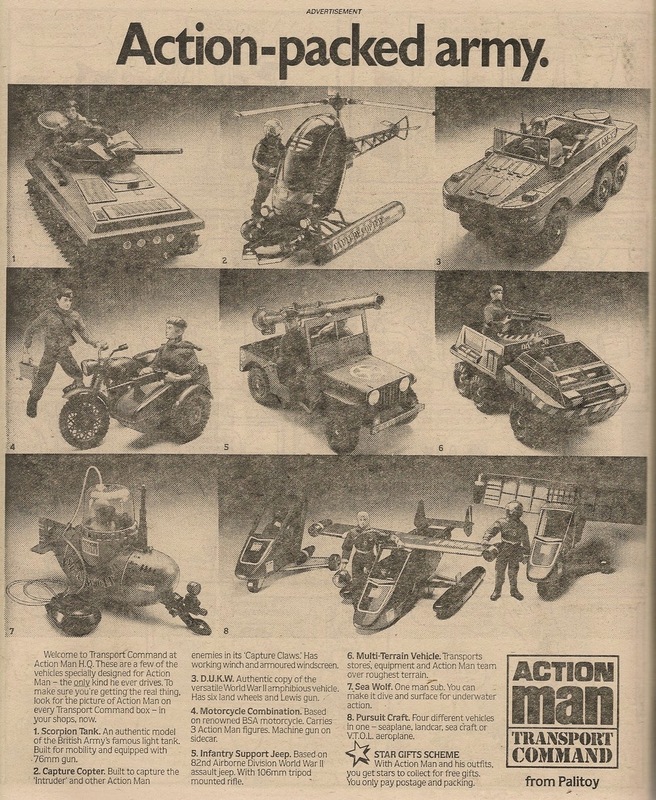 By the time of Cheeky Weekly's first Action Man advert in the 30 June 1979 issue, my Action Men had long since been retired after distinguished military careers often taking them far beyond the call of duty, and the toy had evolved somewhat from the rather basic original. Later models were endowed with malleable, gripping hands rather than the inflexible digits of the versions I had, fuzzy hair instead of the plastic moulded coiffure of the mid-60s, moving eyes and even a voice-box. For all I know, the legs may have even been more securely attached. 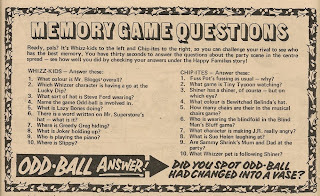 The Cheeky Weekly ad heralded a competition in which the first prize was a trip to the Blackpool Illuminations and a meeting with Action Man himself. Not only that, but a trip to the seafront Action Man Tableau (i.e. 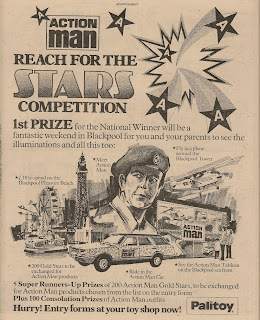 advertisement), a ride in the Action Man car and a princely £10 to blow on Blackpool Pleasure Beach were on offer. 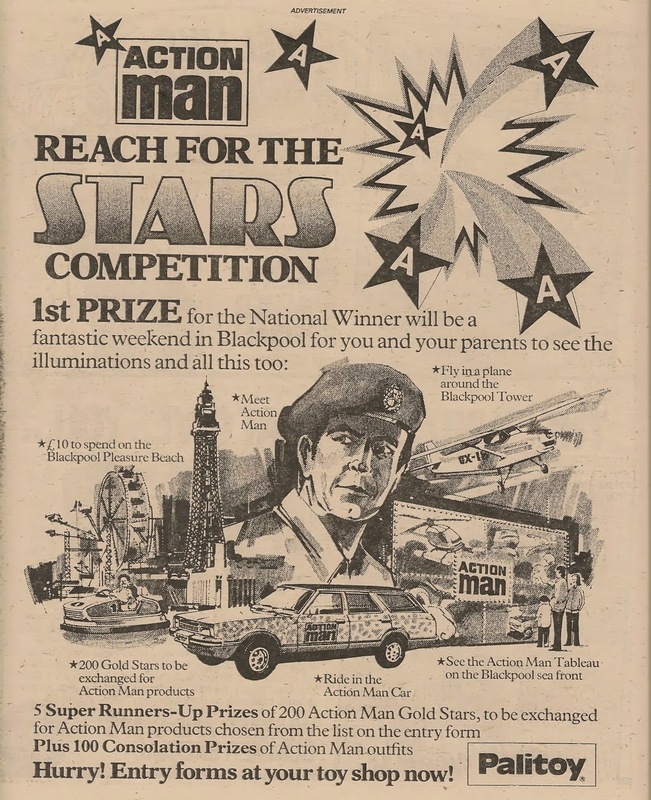 A clever element had been incorporated into the competition - the chance to win 200 Action Man stars (hence the competition name and the five-pointed designs exploding from the page). This mind-boggling booty would, if the late 70s Action Man star exchange rate was unchanged from the mid 60s, entitle the lucky winners to each accumulate a private army of 9 naked Action Men. 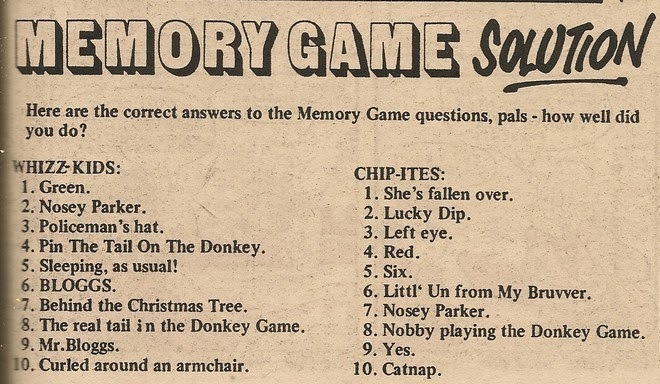 However, the action figures themselves may not have been on offer as, crucially for Palitoy's sales, this aspect of the competition required entrants to study a list of eligible AM products listed on the entry form. Thus those who failed to get a prize but had been salivating over their gear of choice would no doubt add a few items to their birthday/Christmas present lists. 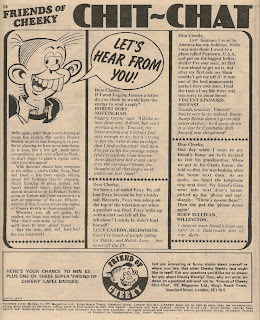 This ad was placed in a late June issue of Cheeky Weekly in order that the winner could be chosen in time for that year's Illuminations which ran for the traditional 66 days from switch-on (by Kermit the Frog) on 31 August. 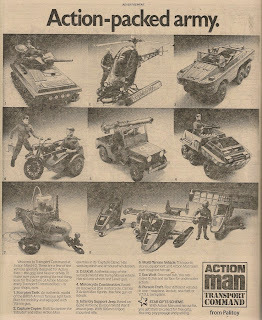 As Christmas 1979 approached another Action Man ad appeared, this time focusing on the Transport Command line of vehicles designed to accommodate the fighting mini-man. 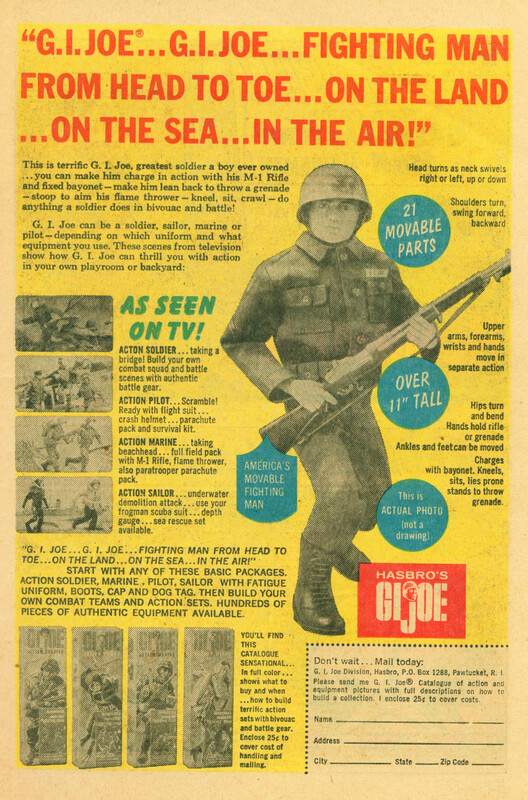 Obviously conscious of opportunist toy manufacturers churning out cut-price AM-scale military machinery, Palitoy were keen to remind readers to look for the picture of Action Man on their packaging. Among the toys being promoted was the Sea Wolf one-man sub, which no doubt enabled the fighting figure to explore the depths of the bath in comfort and without risk of trouser-removal trauma.